1. 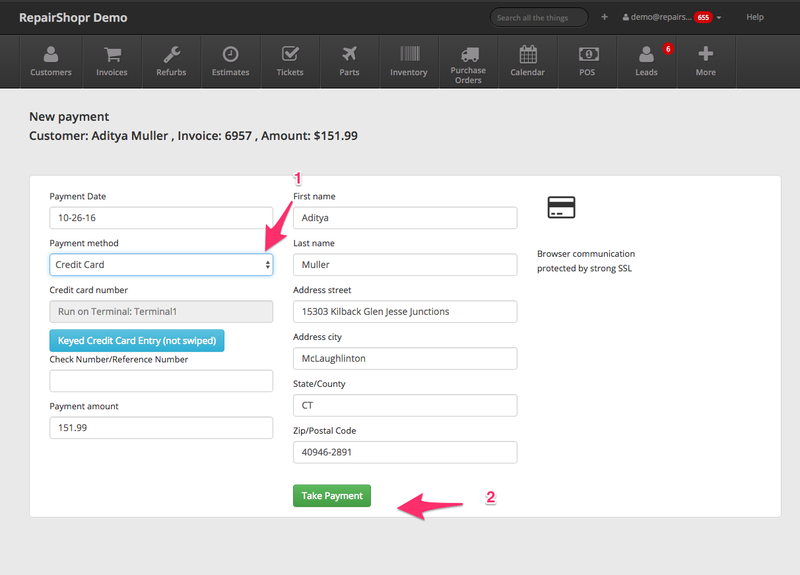 From the invoice page, click "Take Payment"
3. This should "wake up" the terminal - Now swipe the card in the terminal or insert the the card into the EMV reader. If the terminal has network issues or anything goes wrong during the processing, the connection between the terminal and our application can become disconnected. Not to worry! A. Look at the terminal, if it looks like it's still trying to complete a transaction - wait for it. For up to 120 seconds. C. Sometimes if the terminal "retries" a payment (fails once, but works on a retry) it can succeed without telling our application. 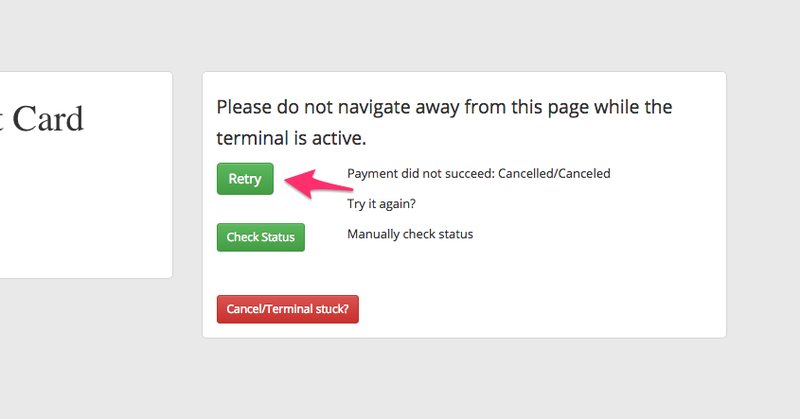 You know that happens if our application page has an error and the terminal says it succeeded with the payment. If this happens, you can click "Terminal stuck?" 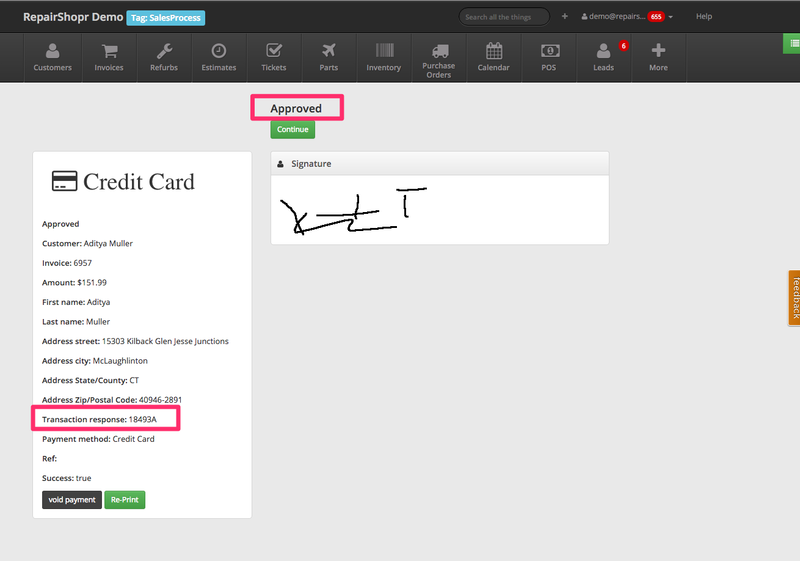 and then "Override" - this will override the payment to be marked down as a success. 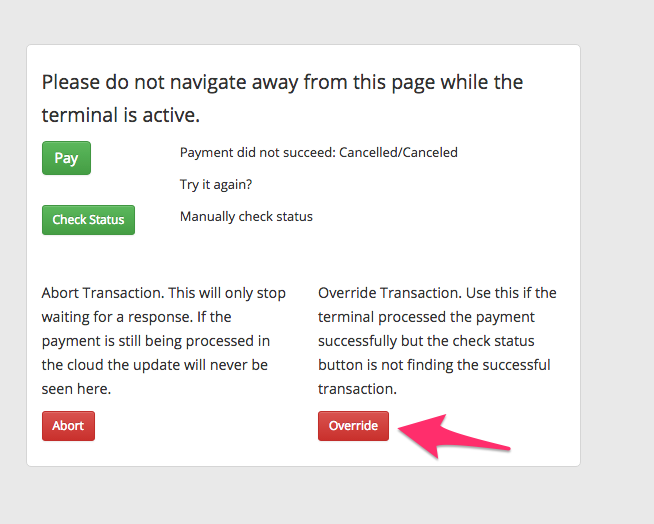 D. If for some reason you navigate away from the page after the payment was initiated you will have what we call a "stuck incomplete transaction" and it MUST be resolved before this terminal can be used again. 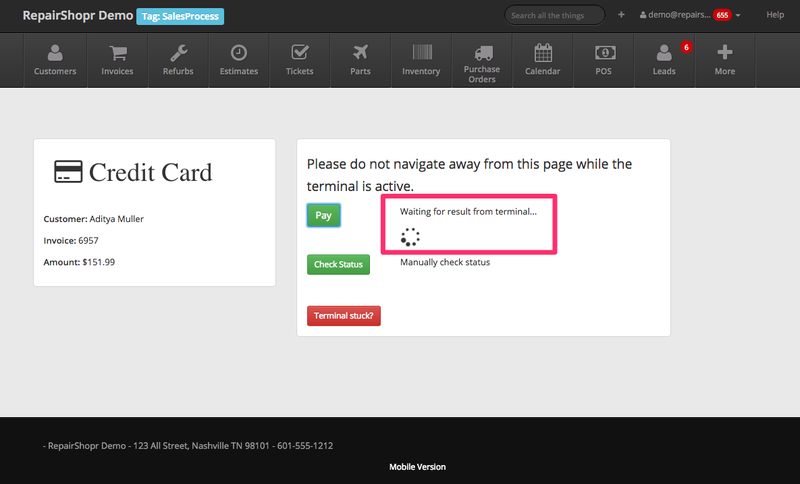 You will see an error message like "You have a payment already active on this terminal! 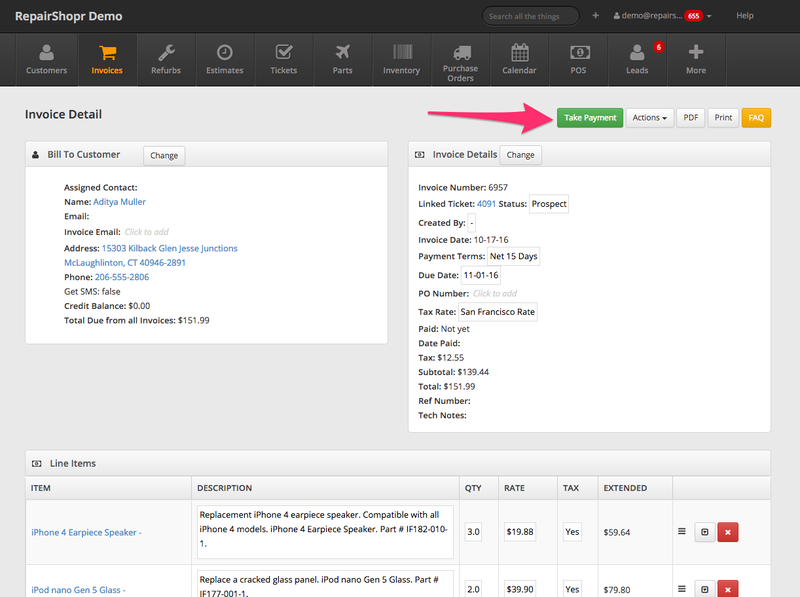 Go here to handle them"
You'll need to click that link and clear up the prior incomplete payment before continuing. 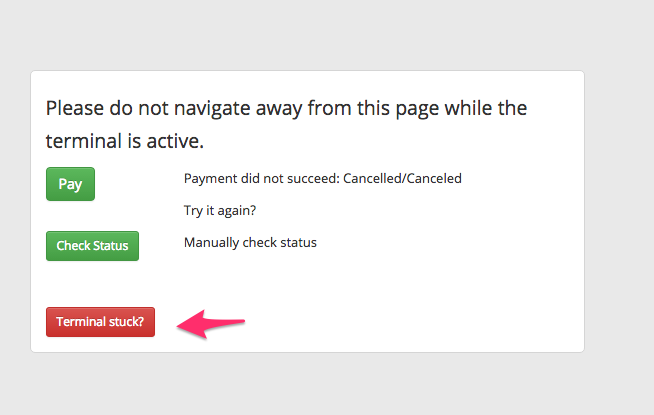 Clicking the link will take you to a list that should show the last payment that didn't complete. 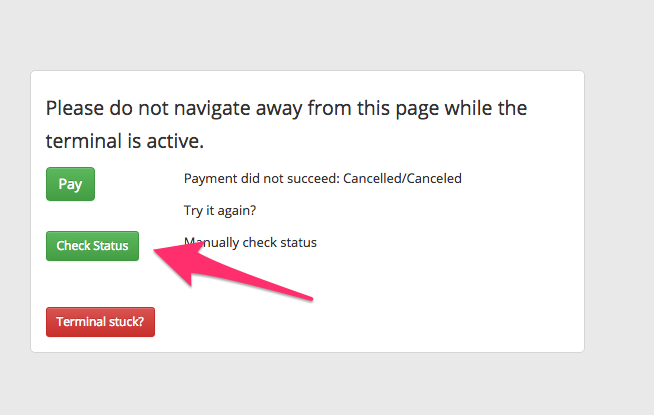 You should probably always hit "Check Status/Resolve" here because it will check with Worldpay to see if it can figure out what happened. E. If you get a decline on their card, you'll have the opportunity to try again, or try another card with the "Retry" button. F. If you try some cards and none are working, they may want to switch to a cash payment. Just hit "Back" on the browser back to the "New Payment" page where you can select the payment method and take it as a fresh payment there. Do not manually close the batch from the terminal, as this may lead to discrepancies in in your reports. It is safe to do a Batch Summary Report at any point.